Public art exists in a space between censorship, gentrification, community engagement, and notions of aesthetic value. These are the takeaways from a recent mural painted in Cleveland by CRP Executive Director and founder Desi Mundo, which became a source of controversy as well as a catalyst for a lengthy community discussion around these topics. It all started when Mundo traveled to Cleveland to give a talk for Community Partnership for Arts and Culture (CPAC), a non-profit arts advocacy group. The organizers specifically wanted Mundo because of CRP’s track record of creating new models for community engagement around public art, and for the work the organization has done around furthering the aerosol aesthetic beyond stereotypical notions of graffiti vandalism, and into the public policy sphere. Mundo gave his presentation, which by all accounts went well. Afterwards, like any visiting visual aerosol artist might do, he asked for a wall to paint. Amy Callahan, of the Waterloo Arts District, then stepped in and directed Mundo to a suitable location. 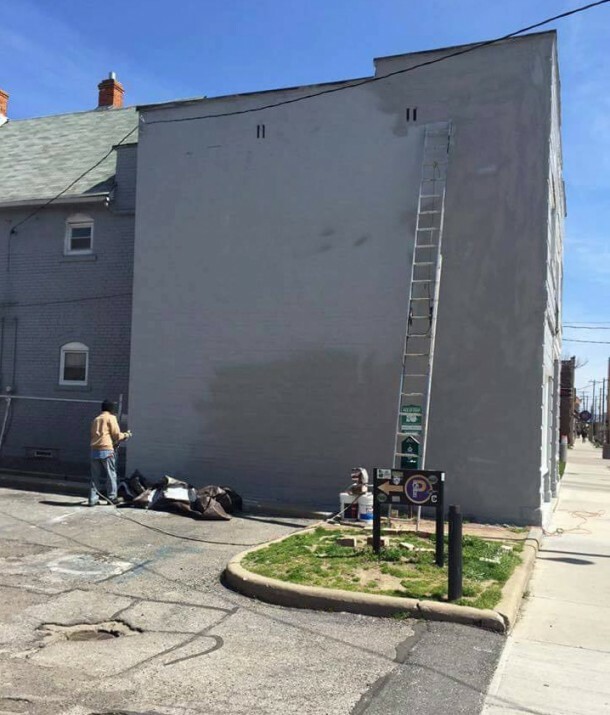 According to Callahan, the property owner had requested a mural be painted some time ago, but didn’t ask for any specific input into the design process. Meanwhile, Mundo asked some members of the local community what he should paint. Originally, he wanted to do a tribute to Tamir Rice, the 12 year-old shot and killed by Cleveland police in 2014, but was informed by locals of another incident even more egregious than the Rice incident. This barrage came after 100 rounds had already been expelled. The incident sparked protests and les to six officers, including Brelo, being fired. 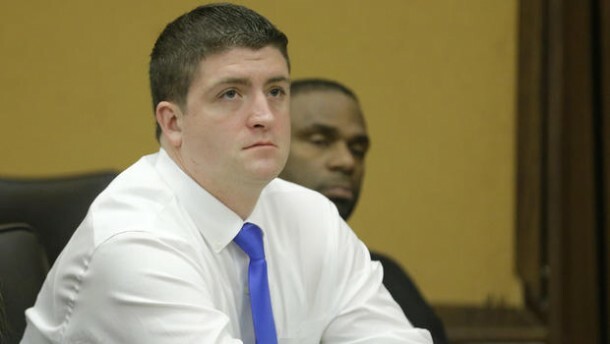 However, Brelo—the only officer charged—was acquitted of manslaughter this past January. The incident also led to a review by the US Department of Justice which led to the Cleveland Police department being placed under a federal consent decree for a pattern of civil rights violations and excessive force. Once the mural was completed, admittedly with a shorter process than the typical CRP work, the intrigue began. An unknown person or persons buffed out the names of the Clevelanders who assisted Mundo with the mural – making it seem as if there was less community participation than was actually the case. A social media thread among members of the Waterloo Arts community, including some gallery owners, began as very critical of the art – “this mural is not something that needs to be highlighted in our neighborhood,” one comment stated; another argued the mural was “graffiti with very little artistic merit” – and eventually evolved into a more nuanced conversation which addressed the relative lack of discussion around POC issues in the Collinwood neighborhood, the role of street art in provoking meaningful discussion, and the question of whether censorship is appropriate to those discussions. Still, the fact that most of the dialogue was between white males opining on issues of importance to African American inner city residents is problematic on many levels. While this was going on, another dialogue was happening via email, as Callahan was being taken to task for an alleged lack of accountability and due process by City Councilman Michael Polensek, who expressed his disapproval with the mural rather bluntly. 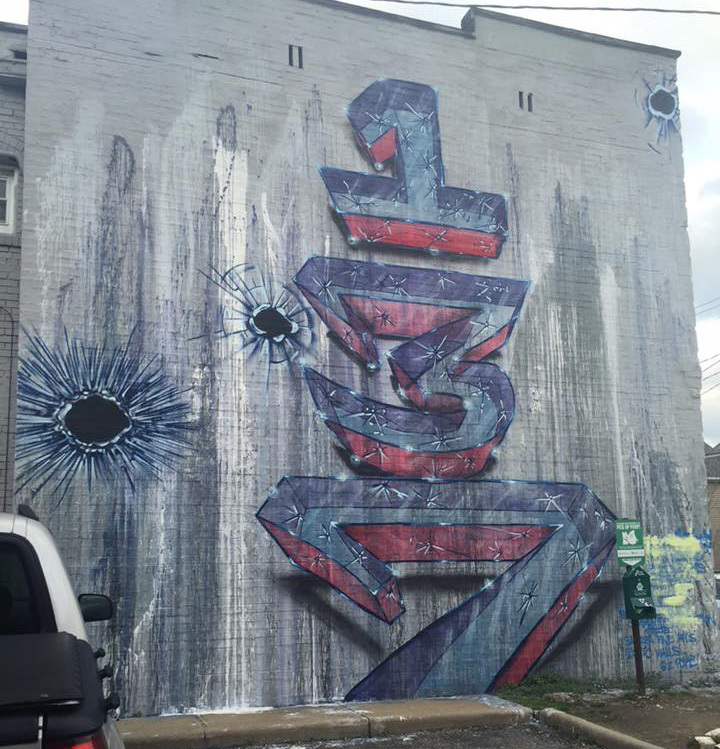 In an email to Callahan provided to CRP, Polensek rails against the mural, which he calls “a piece of crap” and “offensive graffiti.” He goes on to say that a mural with an ostensible anti-police message is inappropriate “in an area [where] we are supposed to be attracting new opportunities and investment” and equates the art work to “vandalism.” Polensek concludes his email with a threat to pull funding from Callahan’s organization, Waterloo Arts. Despite the harsh language, Callahan remained adamant about the mural’s validity. “The Councilman was a bully,” she said in an interview. “There’s no way I would have done things differently,” she added, noting that her organization has facilitated 20 similar murals, some with political content, in the district in the past few years, none of which have been subjected to a design review process. “I was wanting to give artists walls” to paint on, not subject artists to a tiresome bureaucratic process, she explained. Callahan went on to note the “strong reaction was a little interesting when it was a different type of people who were upset.” Unlike some of the other politically-oriented murals, “this one looked more like graffiti, it looked more like illegal art.” That signified, she said, “a lack of control” to some observers. The dialogue, in fact, continued with a public forum presented specifically to discuss the mural and all the issues raised by it, held at the Beachland Ballroom Tavern. The forum started with a discussion between Callahan, queer POC activist Diedre McPherson and author/ artist Kate Sopko. The forum gathered a reported 80 people, and addressed subjects like how art is received in a community space, the consequences of public art and the power of public artwork. Councilman Polensek reportedly attended briefly, made a statement denouncing the mural, then left to go to a City Council meeting. However, the discussion continued, with attendees breaking into small groups mediated by the Cleveland Mediation Society. According to attendee Daniel Gray-Kontar, Executive Artistic Director of Twelve Literary and Performance Art Incubator, the discussion was “imperfect” as the Councilman, property owner and artist were not involved, but still gave life to the notion of public art as a generator for community transformation in East Cleveland. Gray-Kontar added that the public discussion concurred that “the message of the mural needed to stay, regardless of the aesthetic,” and that most folks wanted Mundo to come back and finish the mural. Wait a minute. Erasing the symbol of erasure? You read that right. Despite the community conversation and consensus support for the mural’s message, “We woke up in the morning, [and] we found the mural painted over,” Gray-Kontar said. That was unfortunate, he said, because it made the public forum seem disingenuous, that the community’s input wasn’t actually a part of the decision-making process around the mural, which may have come down to back-channel conversations between the Councilman, the police, and the property owner. At this point, it’s unclear what the next steps will be. CRP hopes that the intention of the community, to offer Mundo the opportunity to form a more detailed visual narrative and complete the mural, will be honored. It’s also possible, however, that future murals commissioned through Waterloo Arts will face a stricter design review process, which in a worst-case scenario would result in a chilling effect on political expression and art which upholds social justice. On the other hand, Gray-Kontar says he is intentional about using public art to bring about social transformation, and further exploring models which do that. Just a note from inside the incident: I’d say comments by white males were equalled by those from white females, and while there were fewer black comments, there were still more than I can remember for any other recent issue. Also, for accuracy, North Collinwood is part of Cleveland (53.3 % black), not 95% black East Cleveland. But we count the East Cleveland Farmers’ Market as one of our treasures.